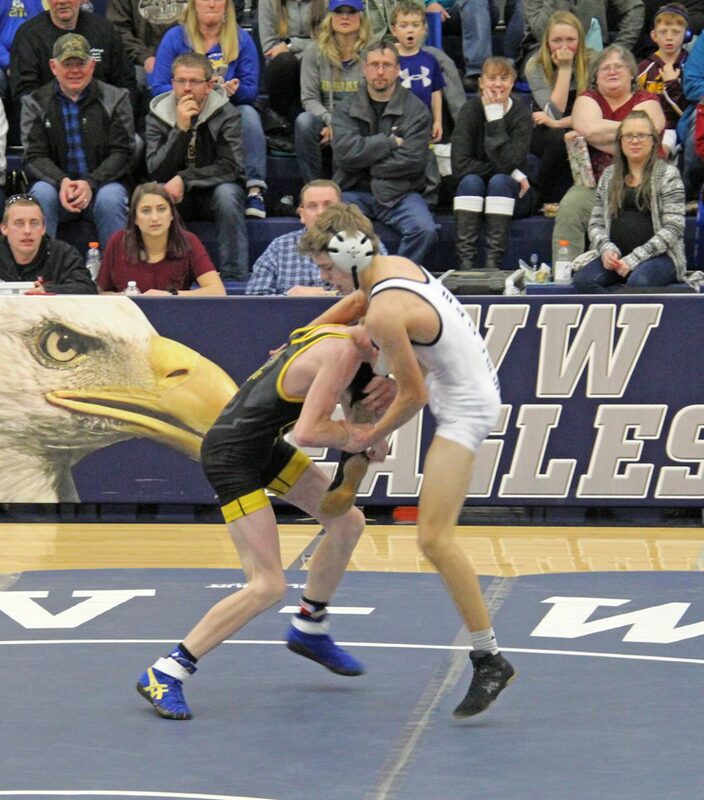 The Eden Valley-Watkins Varsity wrestling squad looked in top form at the Belgrade-Brooten-Elrosa quadrangular on Tuesday, Jan. 22. They picked up a pair of victories in the contest, which was made up of wrestlers from BBE, EV-W, Ortonville, and Osakis. 138: Evan Young (BBE) over Nick Stetzel (EVW) (Fall 1:43); 145: Tyler Bents (BBE) over Trevyn Ludwig (EVW) (Fall 0:33); 152: Zach Nistler (EVW) over Dylan T. Kampsen (BBE) (Fall 5:39); 160: Cooper Wold (BBE) over Jared Carlson (EVW) (Dec 10-3); 170: Isaac Kampsen (BBE) over Carter Mathies (EVW) (Fall 5:09); 182: Mark Jenniges (BBE) over (EVW) (For. ); 195: Michael Doubek (BBE) over (EVW) (For. ); 220: Ethan Kay (EVW) over Thaniel Cebulla (BBE) (Dec 5-0); 285: Austin Schlangen (EVW) over Bryce Feuerhake (BBE) (Fall 2:00). (Eden Valley-Watkins, 61; Ortonville, 3) 106: Teagyn Ludwig (EVW) over Brooklyn Conrad (ORTO) (Fall 2:55); 113: Gavin Caron (EVW) over Nathan Gustafson (ORTO) (Dec 8-0); 120: Gavin Mathies (EVW) over Austin Eastman (ORTO) (MD 8-0); 126: Taylor Ludwig (EVW) over Deaven Boots (ORTO) (Fall 2:50); 132: Thomas Eustice (ORTO) over Sam Nistler (EVW) (Dec 9-4); 138: Trevyn Ludwig (EVW) over Danny Eastman (ORTO) (Fall 0:34); 145: Nick Stetzel (EVW) over (ORTO) (For. ); 152: Zach Nistler (EVW) over (ORTO) (For. ); 160: Jared Carlson (EVW) over (ORTO) (For. ); 170: Carter Mathies (EVW) over (ORTO) (For. ); 182: Double Forfeit; 195: Double Forfeit; 220: Ethan Kay (EVW) over Nathan Ehrenberg (ORTO) (Fall 4:36); 285: Austin Schlangen (EVW) over James Conrad (ORTO) (Fall 0:26). (Eden Valley-Watkins, 49; Osakis, 25) 106: Teagyn Ludwig (EVW) over Logan Grove (OSAK) (Fall 6:58); 113: Gavin Caron (EVW) over Gaven Cimbura (OSAK) (Fall 1:00); 120: Gavin Mathies (EVW) over (OSAK) (For. ); 126: Taylor Ludwig (EVW) over Nathan Kulzer (OSAK) (MD 16-4); 132: Carsten Jacobson (OSAK) over Jackson Geislinger (EVW) (Dec 2-0); 138: Nick Stetzel (EVW) over Tyson Hagedon (OSAK) (Dec 2-0); 145: Trevyn Ludwig (EVW) over Allejandro Ramirez-Garcia (OSAK) (Fall 0:38); 152: Zach Nistler (EVW) over Hunter Harlow (OSAK) (Fall 2:47); 160: Nathan Bjerk (OSAK) over Jared Carlson (EVW) (MD 17-6); 170: Triston Stoetzel (OSAK) over Armando Walker (EVW) (Fall 3:09); 182: Carter Mathies (EVW) over (OSAK) (Forfeit); 195: Brock Faber (OSAK) over (EVW) (Forfeit); 220: Dominic Strom (OSAK) over Ethan Kay (EVW) (Fall 2:58); 285: Austin Schlangen (EVW) over (OSAK) (Forfeit). 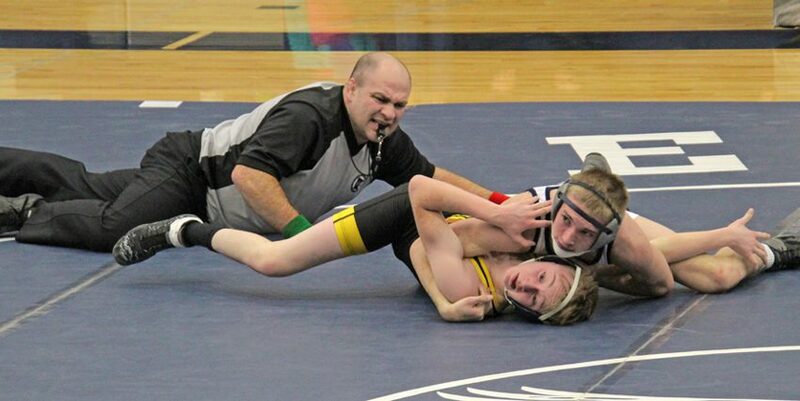 Lucas Jurek at 113# won against Gavin Caron. Photo courtesy of DeeAnn Schueller. Gavin Mathies at 120# won over Brett Schiefelbein. Photo courtesy of DeeAnn Schueller. 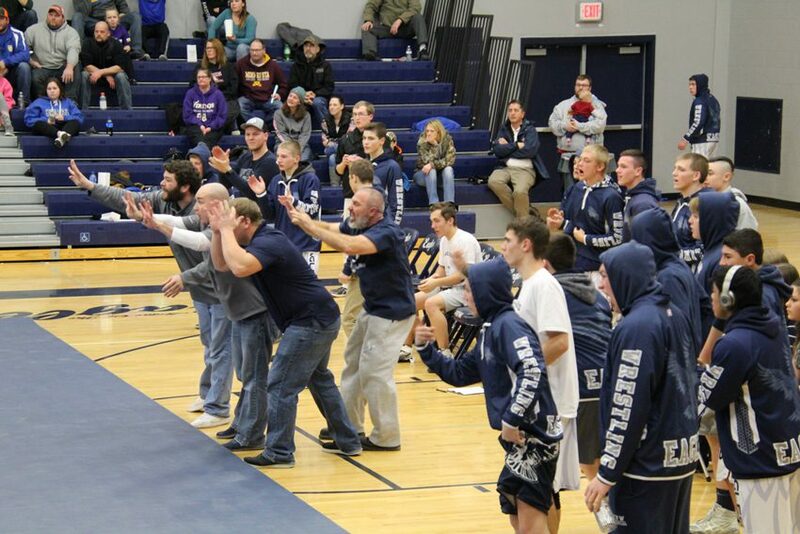 EV-W coaching staff and teammates react during an intense 152# match, Nick Stetzel winning over Josh Donnay. Photo courtesy of DeeAnn Schueller.